The aquatic ecosystem of Hilton Head Island and the Lowcountry is home to a wide variety of animals working in harmony to create the beautiful natural places we enjoy. Among these is the abundant fishery comprised of hundreds of species of animals, all of whom are woven into the food web. Close to the bottom of the cycle are bivalves and crustaceans which eat the barely visible planktons in the water. These shelled creatures provide food for many fish, birds and mammals, each of which has a particular adaptation to get through the shell and to the tasty meat of the prey. One fascinating fish in this group is the sheepshead, the fish with human teeth! 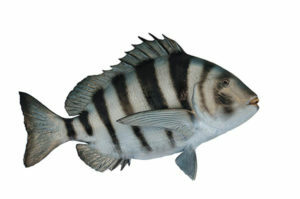 Sheepshead can be found along the entire Eastern seaboard and the Gulf of Mexico. They are unique in that they stay fairly close to shore and to rocky areas, feeding on the shelled animals that live there. They thrive in the brackish waters where creeks or rainwater runoff meet salty estuaries. Because of this unique feeding habitat, sheepshead are sensitive to environmental influences and will leave areas that become polluted. In Brooklyn, NY, Sheepshead Bay is named after this fish, but they no longer inhabit the area due to the increase in waterborne pollutants. Oysters, the favorite prey of the sheepshead, are also very sensitive to changes in water conditions because they are filter feeders and, in the case of oysters, they cannot move to new places when their existing habitat becomes polluted. In order to break through the hard shells of crabs, oysters, mussels, shrimp and barnacles, sheepshead use their uniquely strong teeth. Sheepshead teeth look eerily like human teeth, and perform the same function of grinding and masticating a tough omnivore’s diet. Sheepsheads’ other favorite foods include plants, seaweed and algae. In cooler months, sheepshead will move offshore to spawn, and in summer they stay close to shore. This makes them a fun, great fish to catch and eat this May! You can fish for sheepshead from a dock or a boat. Since they’re omnivores, they’re attracted to a wide variety of bait, including mussels, shrimp and barnacles. Sheepshead prefer undisturbed waters broken by oyster beds or other natural features. Fishing these places can be a bit trickier, but it’s a lot of fun. For the best experience, hire an experienced local guide to show you the technique. 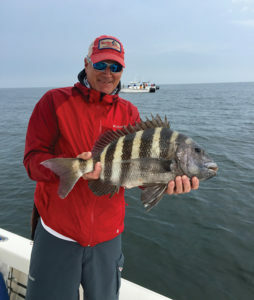 Sheepshead is just one of the fascinating and delicious species of fish that abound in our waters. This May, get outside fishing! Whether you choose a 12-hour offshore charter or a three-hour kayak fishing trip, there is a style of local fishing to suit everyone!